Paintings, photography, and mixed media art by Christen Mattix and Malissa Perry n the gallery for the month of October. The Make.Shift Gallery is committed to engaging the community by showcasing artwork that is fresh & innovative. We support local & regional emerging artists by providing a quality space, raising the standards of presentation & encouraging arts patronage in our community. Check our CALENDAR for the current gallery show. Please e-mail the gallery with your proposal for a solo or group show, including theme/ possible title, type of work, amount of work, and any other details that will help us to determine if your show might be a good fit for our space. Please send relevant images in JPEG or PDF format. The Gallery Committee meets monthly. We will review your submission and contact you regarding any further details. Make.Shift takes a 35% commission on all sales during the run of the show. The Make.Shift gallery is comprised of an entry room and a larger main gallery, totaling approximately 105 linear feet of wall space. Art shows typically hang for 1 month. The opening reception for the show is during Art Walk, the first Friday of the month from 6 p.m. to 10 p.m. 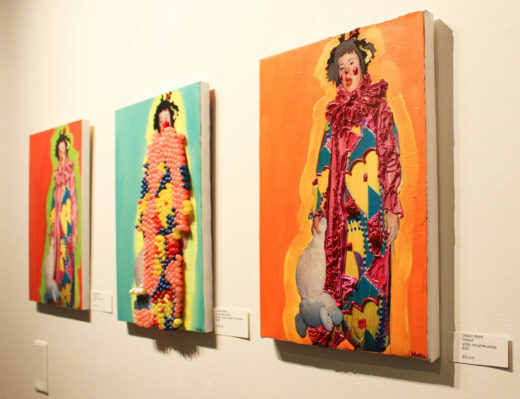 Check out this video on how to prepare your artwork to hang at Make.Shift. The Make.Shift Gallery reserves the right to exclude any work that does not meet our stated hanging requirements. Pictured below are acceptable types of hanging hardware.